Made for my new nephew, Benjamin. 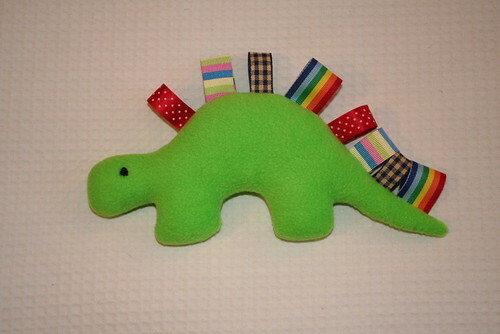 A simple wee taggie Stegosaurus (a Tagosaurus perhaps?) toy using this pattern. I would have preferred a less psychedelic shade of green, but this was the most suitable dinosaur-coloured fleece at my local fabric shop. I embroidered the eyes and put a rattle insert inside when I stuffed him. The rattle inserts are baby-safe and I double stitched the ribbons so it should be OK for a newborn. I bought my rattle inserts on Etsy, but local Wellington peeps might be interested to know that I've since discovered them at Pete's Emporium in Porirua. They are small sealed plastic containers that have a few balls inside. A good way to turn a simple small softie into a baby's rattle.